Who said you shouldn't enjoy your vitamins? B12 Energy Gummies are an easy and satisfying way to help add a boost to your day. Each serving provides 24 mcg of methylcobalamin (B12) to help support energy levels. Instead of artificial flavors and sugary coatings we use ginger root for a distinctive, pleasantly spicy flavor. It's a difference you can taste and a formula we just know you're going to love. 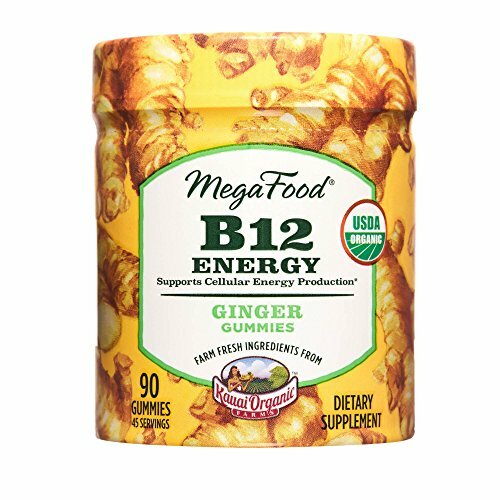 ENJOY YOUR VITAMINS: Get a burst of B12 Energy with a couple of our naturally delicious ginger gummies. POWER UP: Give yourself a boost with 24 mcg of methylated B12 to promote energy levels. NO PILL, NO PROBLEM: Who said vitamins had to be pills? MegaFood gummies make your daily vitamins easy to chew and enjoy. NATURE IS SWEET: Farm fresh ginger root adds rich flavor to each plant based gummy. Who needs high-fructose corn syrup and gelatin anyway? MEGAFOOD FEELING: MegaFood is about nourishing your absolute best self: prepared for the day, fueled with energy, filled with confidence. If you have any questions about this product by MegaFood, contact us by completing and submitting the form below. If you are looking for a specif part number, please include it with your message.